If you are looking for a place that truly has it all, you have come to the right location. Sydney encompasses breathtaking beaches, a metropolitan city, great weather, designer labels and high-end stores, luxury spas, splendid restaurants, clubs and bars for the elite, a one of a kind harbour consisting of the Sydney Opera House and Harbour Bridge, yachts to be rented, places to relax, and places to let your hair down. Whether you are looking for a relaxing vacation or something adventure-filled, Sydney offers both. 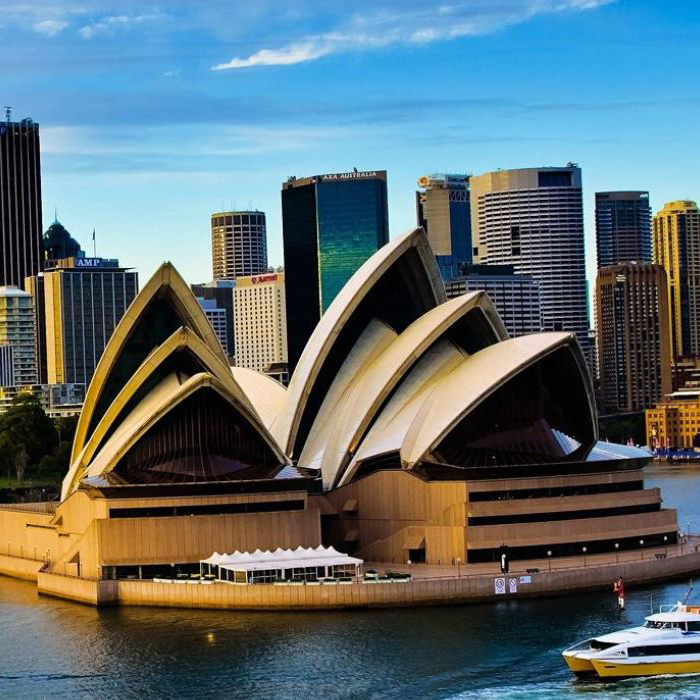 Sydney’s most iconic attractions, the Opera House and Harbour Bridge, are worth viewing. A memorable way to explore the widest bridge in the world, the Harbour Bridge, is by taking part in the bridge climb. The climb is not only exhilarating but it allows for outstanding views of the harbour and opera house. No matter your forte, Sydney is the place to be. What will you experience first? Take a day to explore Bondi, Sydney’s most famous beach. The beach is popular to all and you’ll see a mixture of billionaires, surfers, backpackers, and great bodies. Bondi is one of Sydney’s most stunning beaches and you won’t be disappointed by what you see. The options for shopping are unlimited, as you’re in an internationally known city with top designer stores and brands as well as local well-known designers, quirky shops and sought after stores. Something for any taste can easily be found in Sydney. Sydney has even more to offer, try the world-renowned spas and the almost unheard of and untouched beaches. The weather permits endless days in just your bathing suit. Spend your evenings in your finest attire at one of the many gourmet restaurants, with a combination of breathtaking views and tastes. After you’re finished, make your way to some of the most eccentric and luxurious bars/nightclubs in the area. For lunch, take a seaplane to the renowned, award winning Jonah’s Restaurant. You won’t be disappointed with the views you see, not only on the way to your destination but also when you arrive. Jonah’s Restaurant offers outstanding food and views, good luck deciding which is more impressive! If you’d prefer to discover the area by sea, a yacht is in your future. Rent a yacht with a captain and crew and enjoy a nice cruise for an afternoon, evening, day, or week! There is so much to discover and by yacht you’re given the advantage of exploring more than what can be seen on foot. Sydney’s history begins some 45,000-60,000 years ago, in prehistoric times, when the Australian Aborigines’ ancestors settled in Australia. In the 17th Century, Europeans frequently visited the west and north coast of Australia. The well-known Pacific explorer, Captain James Cook, charted the east coast for the first time, in 1770. On 29 April, Cook claimed the entire east coast for King George III, naming it New South Wales. In 1788, the city was made into a penal colony by Great Britain, when the First Fleet of British ships arrived. Arthur Phillip founded a convict settlement and 11 ships arrived at Bontay Bay on January 18, 1788. The location was moved to Sydney Cove on Port Jackson just two weeks later, due to the area being unsuitable for habitation. In 1808, the infamous Rum Rebellion took place, resulting in the overthrowing of the Governor, William Bligh. Shortly after, in 1840, the city established an elected city council and due to pressure from Sydney’s citizens, England discontinued the transport of prisoners. In 1842, Sydney officially became a city and just ten years later gold was discovered, drawing in people from all over the world in search of their fortune. Sydney’s town hall opened in 1888 and from 1788-1900 Sydney was the capitol of the British colony of NSW. When NSW finally voted to join the Australian Federation, in 1901, Sydney became the state’s capital. Australia became a Commonwealth in 1901 and just 31 years later, in 1932, Sydney Harbour Bridge was completed and opened. Finally, in 1973, the Sydney Opera House opened its doors to the public. Exuberance in architecture is a legacy of the prosperous decades that followed the gold rush, with Victorian edifices being built to house a burgeoning society. The public symbol of this period is the mellow golden local Sydney sandstone used to build places such as Town Hall, the General Post Office and the rapidly multiplying offices of the civil service in the eastern side of the city. By the end of the 19th century Sydney was one of the largest cities in the western world, with a population of half a million people. Today, Sydney is Australia’s largest city, as well as a massive international capital of finance and culture. Sydney has also hosted many international events, such as the Summer Olympics in 2000. Stand across Sydney’s breathtaking natural harbour, the Bridge has become one of the most famous of our beautiful city. It is the main point of crossing of Sydney’s bay. The iconic Sydney Harbour Bridge is amazing to watch and even more to climb. The historic tale of construction attracts people from all over the world likewise the discovery of an awesome feeling. If you want to take some rest after your climbing, you can simply delight the view at Quay restaurant. Located in front of the opera house. At Quay the aim is to match the breathtaking harbour setting with ultimate modern Australian cuisine. The stunning Taronga Zoo is really close to the city by ferry, with breathtaking views of Sydney Harbour. There are lot of shows and keeper all along the day. You’ll discover more than 4000 animals and in the same time appreciate the view of one of the most beautiful bays in the world. Also if you want to learn more about wildlife you have to know that each year Taronga provides education experiences..
No matter what the season is, the Blue Mountains are the perfect place to take a walk in the fresh air with friends or your family. Glowing in autumn, cool in winter, colourful in spring and refreshing in summer, this magical place is immersed on a blue atmosphere due to the blending of finely dispersed droplets of oil, dust particles and water vapour which scatter short-wave length rays of light. Be it for an afternoon or a couple of days, let’s admire this stunning nature. The Queen Victoria Building erected in 1898 is the fifth and last of the arcades built in Sydney in the Victorian era. It is the only one staying in its original form actually. This major attraction for both visitors and residents is the perfect place for a shopping session and a time travel through the Old-Worlde shopfronts on three levels. Either it is by curiosity, chance or by desire to go shopping, the QVB will carried you away. The Royal National Park is the second national park in the world. In this natural haven, open ocean, sandstone cliffs and wetlands meet grassy woodland, rainforests, coastal heathland and eucalyptus forests. Enjoy historic landscapes and short walks to lookouts with spectacular views over the park. Hire a row boat at Audley and take a leisurely paddle up Kangaroo Creek. The area around Lake Macquarie in Sydney’s north is just about 2 hours north from the city and is the perfect place to see some spectacular landscapes – from rainforests, and beaches to bushland, Lake Macquarie has it all. Add to that the wildlife such as our colourful native birds, the migrating whales, koalas, dolphins and a roo to two. And the iconic lake itself shouldn’t be forgetten, of course. Discovering the treasures of the region in your hiking boots is as intimate as it gets, and healthy too, of course, no matter your level or your age. A festival full of many exciting things. These things include art, open-air concerts and theatre performances. There is something for everyone to see and do. This is a great excuse to get outdoors and enjoy the summer weather in Sydney. Vivid Sydney is a unique annual event of light, music and ideas, featuring many of the world’s most important creative industry forums, a mesmerizing free public exhibition of outdoor lighting sculptures, a cutting edge contemporary music program and the spectacular illumination of the Sydney Opera House sails. It positions the city as the creative hub of Australia and the Asia Pacific region and delivers innovative live entertainment and inspiration on a grand scale. Vivid Sydney is where art, technology and commerce intersect. It is a summit, forum and playground for the creative industries. The creative-minded people of the world – from professionals to the curious – are invited to Sydney annually to transform the city into a breathtaking canvas of creative expression. A popular 14-km run that sees around 50,000 participants pound the pavement. The event starts at Hyde Park, in the middle of the city and ends at the iconic Bondi Beach. Take some time off of the sand to cheer on the runners or join yourself. A 10-day sculpture exhibition along the Bondi to Bronte coastal walk. If you were already planning to do the coastal walk this should give you even more motivation and desire to see the sights. Not only are the natural sights beautiful but the sculptures installed are extremely pleasing. Along your walk you will see the breathtaking coast combined with contemporary installations that make you think. Enjoy! The world-famous 2,000-km yacht race departs Sydney Harbour on December 26. A sight to see and many attend every year. Outstanding yachts take part in the race, allowing for spectacular sights. A great way to explore Sydney and all that it has to offer; breathtaking views, the city from a new perspective, beautiful nature, and so much more. If you’re looking into the iconic Jonah’s Restaurant for lunch, this is the way to arrive. Truly unforgettable. Another way to explore Sydney, equally as exciting as by seaplane but a completely different kind of experience. Rent a yacht to get away from the normal hustle and bustle of the city and experience time on the water while the captain guides you on your journey. Sydney Harbour: One of a kind and worth taking the time to explore. Have a nice meal or just walk around and take in the sights. The Harbour Bridge: The world’s largest bridge. This iconic bridge is a sight to see. You can experience the sight of the bridge from the Opera house, the royal botanic gardens, taronga zoo, seaplane, yacht and so much more. The Harbour Bridge Climb: Something that the whole family or just one can enjoy! Climb the widest bridge in the world for an unforgettable experience. Take a look around and see wonderful views of the harbour, don’t forget to brag to your friends afterwards! Sydney’s most iconic attraction. Attend a performance in the most internationally known opera venue or simply take a trip to see it up close. There is a spectacular restaurant, the Guillaume, located inside allowing for an unforgettable experience when paired with a night attending a performance at the opera house. It’s impossible to miss the Sydney’s largest dining, shopping and entertainment precinct. After a waterfront promenade on Cockle Bay and on the Chinese Garden of Friendship, surrounded by waterfalls, lakes, exotic plants and secret pathways, why not visit the SEA LIFE Sydney aquarium or the WILDLIFE Sydney zoo which welcomes now Rex, a 5 meters alligator. Let’s now take a break and delight your taste buds on King Street Wharf, a famous place for being a dynamic nightspot with sleek dining establishments, trendy bars and funky nightclubs. The outdoor events and the weekly fireworks at 8h30 will perfectly close this discovering day unveiling an overview of Sydney’s atmosphere. This is also a perfect place for kids with all the outdoor spaces and the Darling Quarter Playground with water games, climbing ropes, slides, swings, sandpits and flying foxes. Enjoy stunning view of the highest place of the New South Wales capital in the middle of the CBD and let yourself be tempted by the Sydney Tower Buffet. This contemporary self-select restaurant offers an extensive banquet-style dining experience with uninterrupted revolving views of the city. Sydney Tower Buffet provides the perfect relaxed dining environment in the heart of Sydney. At only 2,5 hours by car of Sydney, you’ll have the feeling to be in a tropical Island. Obviously that it’s one of the most beautiful and unspoilt areas. The discovery is entire with prolific marine life, diving, walking, wineries, and one of the most stunning beaches you will ever find. Indeed Hyam’s is famous to be the beach with the more white you will never find in Australia. As paradisiac as Jervis Bay but in the north direction, Port Stephens is known for its wonderful beach. Many golden beaches are amazing for surfing and beach walks. One Mile Beach, Box Beach and Fingal Spit are the three which are simply perfect for experienced surfers. This idyllic beach getaway also has freshly-caught seafood, local wineries and waterside. “Escape the everyday, every day”, this sentence is very essence of the Rocks. The historic area of Sydney’s city centre has plenty of secrets to share from the traditional home of the Gadigal – first inhabitants of Sydney – to the roughly-laid cobblestone laneways, the Cadman’s cottage and more. Let yourself be taken away by this urban locality while enjoying a picnic lunch under the Harbour Bridge or an alfresco dinner under the stars, going shopping at The Rocks unique retailers and markets and taking time out in a gallery or museum. This oasis of 30 hectares in the heart of the city, just 10 minutes walk from the CBD and at the feet of the Sydney Opera House occupies one of Sydney’s most spectacular positions. Established in 1816, the Gardens are wrapped around Farm Cove at the edge of Sydney Harbour and present an outstanding collection of plants from Australia and overseas. From the provocative rare and threatened plants of the world to the romantic rose garden, the themed garden areas show the diverse beauty of nature without missing the aboriginal heritage. Hyde Park is Australia’s oldest and biggest park. It’s also one of the most well-known. With just over 16 hectares of wide open space in the heart of central Sydney, there is no shortage of lush grass if you want to claim a small piece of land for an impromptu picnic, or simply have a seat and take a breather. You’ll always be able to spot sunbathers clustered around in twos and threes, lazily soaking up the sun’s rays. There are also plenty of benches in the park if you want to put your feet up without ruining your Sunday best! St Mary’s Cathedral stands in the centre of Sydney as a testimony to English Gothic style and is dedicated to the “Immaculate Mother of God, Help of Christians”, Patroness of Australia. Generations of artists have bequeathed to it their magnificent gifts in stone and glass, designing a unique space of solace and prayer within this vibrant city. This Cathedral, shaped from the local yellow-block sandstone on which this city is built, represents the spiritual origins of the Catholic Church in Australia. This atypical island had a kind of special history that you can discover all along your visit. First occupied by the Aboriginal people, then transformed in a penal establishment this old prison was converted few year after and becomes the major shipbuilding and dockyard facility. Plenty of history, this is a real world heritage. A sydney harbour’s permanent floating venue is arrived. Indeed Seadeck become a Harbour-cruising venue. In Seadeck pretty much wherever you are on board, you’ll find yourself eye-to-eye with panoramic harbour views. There is a real ‘European’ atmosphere, reflected in the ship’s avant-garde design, featuring natural colors and minimalist décor. Making the most of stunning views of the harbour and city, The Star boasts over 20 restaurants, bars and cafés as well as a luxury 16-room day spa, events and entertainment center and upscale retail and casino areas. As part of an $870-million redevelopment, The Star features a new event center that can cater to international performers, intimate concerts, corporate conferences, exhibitions and 900-seat banquet functions. A key feature of the redevelopment is The Darling, Sydney’s newest luxury boutique. The hottest Sydney nightclub, Marquee, is fast becoming the city’s favorite hot spot with national and world-famous DJs on the decks and celebs on the red carpet. Aria is an award-winning restaurant in Sydney located at Circular Quay, on the very edge of Sydney Harbour. It provides a dining experience with striking harbour views, with an award winning menu and extensive wine list, served in an intimate and elegant dining room. Owned by chef Matt Moran and restaurateur, Peter Sullivan, ARIA first opened its doors in 1999 and is highly regarded and awarded both locally and internationally. ARIA currently holds two coveted Chef’s Hats and was awarded the, ‘Diner’s Choice’ award by the readers at the Sydney Morning Herald Good Food Guide 2012 Awards. Aria Restaurant is located at East Circular Quay with entry from the Macquarie Street side of the Opera Quays building. Gracing the cliffs of South Bondi, embracing the panoramic views of the world’s most iconic beach, lays a unique Australian dining experience. Since opening the doors in December 2002 Icebergs Dining Room and Bar has shared rare and uninterrupted views of the wondrous Bondi Beach with all guests. Every guest is invited to appreciate the uplifting experience and relaxed elegance of the location. From the expansive ocean horizons to the yellow sands of the legendary Bondi Beach, Icebergs Dining Room and Bar is a unique celebration of this remarkable corner of the world. An intimate secretive late night lounge for Sydney’s elite party crowd, Gilt is the new pleasure centre of Sydney. With an adventurous cocktail selection, and the sounds of the hottest lounge music Gilt is where you should be. The Baxter Inn is a classy basement bar in Sydney that most tourists never know about. It’s situated on Clarence Street and you have to look closely to find it. The Baxter Inn doesn’t need a fancy sign for people to flock there. Inside you’ll find a candle-lit atmosphere with jazz and blues music playing. Whiskey drinkers will be in heaven, as the bar stocks over 360 different kinds-one for every day of the year. Find your way to Baxter Inn and you’ll fit in with the classiest Sydney natives. Known as the “social hub in the sky” the Summit Restaurant and Orbit Bar is located 47 floors high with a dazzling view of Sydney on all sides. You can taste a variety of Australian dishes at the Summit Restaurant or head over to the Orbit Bar (adjacent to the restaurant) for incredible cocktails and tapas. Sydney’s highest social hub is not to be missed. Surry Hills’ The Winery is the fastest growing place to be for men and women in the neigbourhood. It features a great wine list, courtyard and private dining rooms, and hosts fashion markets on Saturdays. Whether you’re just popping in for a drink or planning something more substantial you’ll find something on the menu to suit from starters and sharing plates to hearty mains and an impressive wine list.